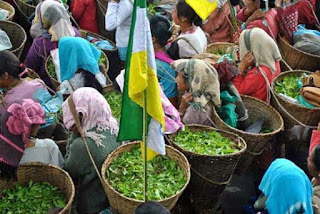 The Gorkha Janmukti Morcha affiliated Darjeeling Terai Dooars Plantation Labour Union today sent a letter to Prime Minister Narendra Modi requesting for allowing wage payments in cash to tea garden workers of the hills till such time proper infrastructure is put in place to facilitate compliance to electronic payments. The trade union sent the letter through Darjeeling MP S.S. Ahluwalia, following the circular issued by the Centre and the RBI to tea garden managements directing them to open bank accounts for workers in any nationalised bank to facilitate wage payments. As per the union, the directive was premature and not of significance to workers’ interests. Following the demonetisation of Rs500 and Rs1,000 notes on November 8, the managements of the 87 tea gardens of the hills had requested the state government to intervene. Taking cognisance, the central government had allowed workers’ wages to be transferred to the account of the Darjeeling district magistrate, which would then be disbursed in cash to the managements for distribution to the workers. But even though the process has got underway, payments have been made to only 40 per cent of the 55,000-odd workers in the hills, while many have to get wages of two weeks. According to the DTDPLU, opening bank accounts for workers would take time and moreover, the tea gardens in the hills lacked ATM facilities. “Opening bank accounts for the workers is a huge task and time consuming. How will they sustain their livelihood without money till then? Also, the tea gardens are located far away from the nearest bank or ATM. We feel that until banking infrastructures including ATMs are established in the gardens, wage payment in cash should be reintroduced,” said DTDPLU general secretary Suraj Subba today at a press briefing in Darjeeling. He said the daily wage of a worker is Rs132.50 and weekly earnings after deduction of provident fund amounts to Rs700. Since the gardens are located at fair distances from towns and markets, the minimum travelling cost incurred to reach the nearest bank or ATM would be anywhere from Rs100 to Rs200 in the hilly region of Darjeeling. Further, the DTDPLU argues in its letter to the prime minister that if the workers do adhere to the circular and open bank accounts, they would have to stay away from work for a day to withdraw weekly wages. “As it is, wages are low, but if the management remains adamant in honouring the circular, a worker’s real earnings per week would come only to Rs400-500, which would be injustice,” Subba said even as he welcomed the Centre’s decision to demonetise Rs500 and Rs1,000 notes to weed out black money from the country. The DTDPLU also said that unlike Assam, the Bengal government had failed to take proactive steps to mitigate garden workers’ woes. “The Assam government has taken steps to help garden workers by opening ATMs and bank branches. But our state government has failed to do anything of that manner,” Subba said. On the issue of opening bank accounts, the DTDPLU general secretary said only about 30 per cent workers did not have accounts. “With the management paying PF and gratuity, at least 70 per cent of workers have bank accounts. Still, the management has started opening accounts even for them, which is taking time,” Subba said.